Pro Catalan independence rally In Barcelona, September 2015. Jordi Boixareu/ Flickr. Some rights reserved.Developments in Catalonia have caught the attention of the worldwide media over the last few years. Since 2012 Catalans have experienced huge civic mobilisations claiming the right to democratically decide their futures. During these last few years many Catalans have stopped believing that they can indeed have a better country inside the Spanish State. The Catalan Government and Parliament have taken each and every possible step to organise a self-determination referendum so that people can choose. Unfortunately, this has all been in vain. Being a mayor of a Catalan town myself, I initiated two specific actions during the past few weeks after the vote that took place on 27 September. The first action was to organise a remembrance for former President Lluís Companys on the eve of his execution at the hands of Spanish Francoist authorities in 1940. Lluís Companys, who was head of the Catalan Government as well as president of my party Esquerra Republicana, remains the only democratically elected President to be murdered for political reasons while still in office throughout the whole of European history. After the fall of Barcelona, Companys went into exile in France where he was then detained by the Gestapo in Brittany and handed over to the Spanish authorities. In Spain he faced a fake military trial and was finally executed in Barcelona’s Montjuic fortress. By killing a man, the fascists tried to eliminate a country. As others had tried to do so many times before. Exactly 75 years after these tragic events, on the very day we were commemorating the murder of President Companys, another Catalan President was summoned before a court. The current President, Artur Mas, is facing criminal charges for allegedly having organised the non-binding consultation on 9 November 2014 where, despite all the threats and intimidation by Madrid, 2.3 million Catalans went to the polls to cast a symbolic vote on self-determination (80% of whom voted for independence). Mr. Mas, along with two other ministers, was charged for disobedience, principle counterfeiting, misuse of public funds and unauthorised seizure of public offices. On the same day, along with 400 other Catalan mayors, I had demonstrated that morning in front of the Barcelona court palace to defend the very concept of democracy, to say that we were also guilty for having supported and participated in that kind of vote and to stand by the side of our elected President. We demonstrated there because it is simply a shame that the Spanish State tries to punish another Catalan President, this time for having put in place ballot boxes and for having allowed citizens to express their opinion regarding their country’s future. In a press statement right after his appearance before the court, Artur Mas explained that he told the judge: “you will have to decide whether I am a criminal or a democrat”. It is simply unacceptable, in a democratic state, that a President can be punished for exercising sheer democracy, for allowing people to vote. It is a shame that this is happening right here in the European Union and for the sake of the unity of a state, a unity that seems to stand above everything, including democratic values and practices. While the Spanish government tries its best to show to the world its rather weak democratic credentials and –to put it mildly- its very weak commitment to democratic values, the newly elected Catalan Parliament has got a democratic mandate for independence. So, despite all the disproportionate reactions of the Spanish institutions that try to put a fence around the democratic aspirations of the majority of Catalans and also threaten to put in jail our elected representatives and to suspend our own institutions, the trajectory towards independence goes on. Since it has become impossible to organise an agreed and binding referendum like the Scottish one, the last parliamentary elections held on 27 September 27 had a plebiscitary character. Although formally it was just another election to set up the regional parliament, in real terms it was about getting a parliamentary majority for independence or not. In the last Parliament elected in 2011, there was a near two-thirds majority in favour of the right to decide, that means in favour of finding a democratic way to know whether the Catalan people want their country to become an independent state or not. Just two parties, the Republican Left of Catalonia (ERC) and Popular Unity Candidacy (CUP) - a far left, pro-independence party - participated in that election with a clear proposal for independence. These two parties won 24 out of 135 seats of the house. The mandate to the former parliament was not outright independence, but rather the calling of a referendum. In last September’s election and after all the failed attempts to organise that referendum, two different platforms emerged and participated in the elections with a clear programme for independence. Junts pel Sí – Together for Yes – which is a coalition between my ERC, Convergència Democràtica de Catalunya (Artur Mas’ party) and several pro-independence civic platforms, on one side and CUP on the other side. These two lists managed to get 72 representatives or an absolute majority of the seats: 62 for Together for Yes and 10 for CUP. So the practical result of the last election was that the number of pro-independence MPs went up from 24 to 72 and that for the first time ever there is now an absolute majority in the Parliament in favour of independence and with a clear democratic mandate to achieve it. We will honour that mandate and will make use of that legitimate majority by putting in place, as soon as possible, our roadmap towards independence. This roadmap will precisely define the terms and steps that are currently being negotiated between Together for Yes and CUP. Should there be an agreement, and I am sure there will be, a new government will be formed in the next couple of weeks. It is true that we were slightly short of the absolute majority of votes, since “only” 48% of all the votes cast –with a record 77.4% turnout- went to pro-independence lists. The rest, the other 52%, should by no means be counted on the No side. The lists clearly opposing independence got 39% of the votes. The rest went to parties that support Catalonia’s self-determination, albeit not being clearly for independence. So the second reading of the results is that, would there have been a referendum, we could have had a real chance to win it. These results are even more significant when taking into account what the kind of electoral campaign we went through mean. 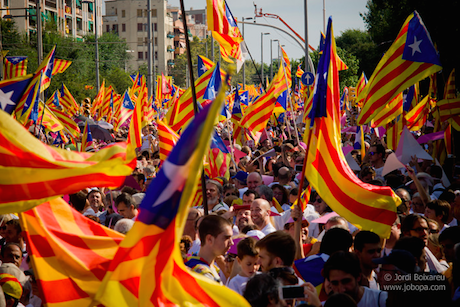 The Spanish version of “Project Fear” was as intense and as humiliating, but not as effective, as the one London used against Scottish independence, partly because Catalonia has some influential media that supports its independence. Of course the Spanish reaction to the election results was exactly the one expected: blind. Mainstream media and government minimised the victory of pro-independence forces and presented the results as a failure of the Together for Yes coalition, since it did not get an absolute majority alone. Meanwhile, as if we were living in two parallel realities, the mainstream international media underlined the victory of pro-independence parties and the fact that there would be a parliamentary majority pushing forward independence. It was shocking to compare headlines coming from Madrid and elsewhere in the world on the morning after the elections. Having said all the previous, it is obvious that the Catalan process towards independence is advancing. And this is happening because it is a strong, democratic revolution. It is a grass roots movement with wide support, based on legitimate values and aspirations. There remain, however, both imaginable and unimaginable difficulties, because we are dealing with a state that denies our right to choose our own future and does not wish to see that Catalonia is a distinct political community with the right to take mature decisions. This state hides behind formalities in order impede the exercising of true democracy. Over the past few years, whenever we talked with the international community, they asked us to come back with a democratic mandate for independence. Well, we now we are back with that mandate. While we know that the Spanish state will do nearly everything possible to prevent the mandate from being implemented, we will go ahead and we wont be intimidated. What we have to win, for us and for the future generations of Catalans, is much more than what we might lose.